Our thoughts define who we are. If we are not careful we can fill our minds with negative things which are filled with negative 'energy'. These things cause us to feel sick to the depths of our souls and in every cell of our bodies. Research is finding that our thoughts can make us sick or heal us. Let's do the latter. Each word we mull around in our minds has an effect on our soul. The way we spend our time in places of light or darkness - makes a difference in how we feel physically, mentally, and spiritually. In fact, those three things are all connected into one whole; our person. 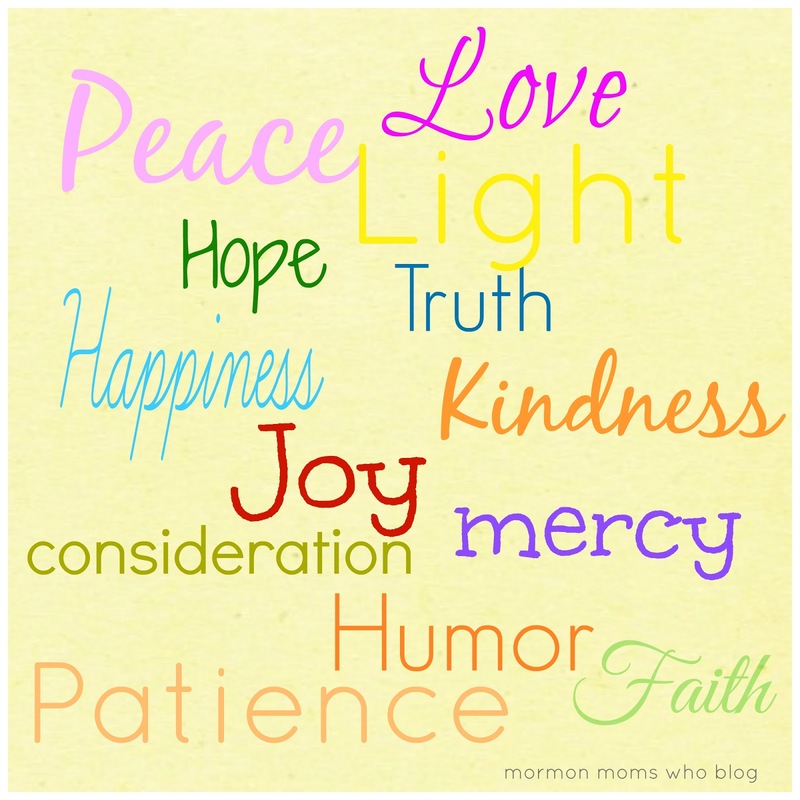 Here are 15 words which lived and practiced will bring greater Peace and Joy into each of our lives. They are time-tested true principles. 1. Love: the most powerful emotion in the universe. 2. Charity: the 'pure love' of Christ - by which all things were made that were made. 3. Kindness: to ourselves and to one another. It's a truth. 4. Hope: Trust in the truth gives us HOPE that all things will work out, in the end, if we continue to press forward in the Light. 5. Light: a beautiful energy which lights our way, our path, our thoughts and our energies. It gives us greater insight into what matters most and 'lifts' us to find a better way. 6. Truth: a favorite energy path that teaches us the way to go, gives us hope and light; as all are interconnected. 7. Happiness: the design of our existence and will be if we let all things go that are not of happiness. 8. Forgiveness: a healing power which is priceless. Weight can be lifted immediately as soon as we 'let go and let God'. 9. Repentance: denotes a change in our heart, a desire to do better, a lifting of the soul to a higher realm when we truly understand this God-given principle; an incredible gift! 10. Mercy: to and with one another for our weaknesses, imperfections, inherited traits we're trying to overcome, false beliefs which hold us back, lackings, longings etc. They all help teach us patience. 11. Patience: with ourselves and one another. Most of us want to do better and to be happy. Patience is a trait to be 'practiced' as we experience life-schooling together. 12. Humor: a gentle way to let the experience the load a bit lighter. 13. Wonderment: Creativity, Learning, Awe at God's creations - gives us hope that there is a plan for all of this and for all of us. We're not here by chance. All these things have a great purpose. 14. Good Cheer: "Be of good cheer, for I have overcome the world" is the whole reason we're here. 15. 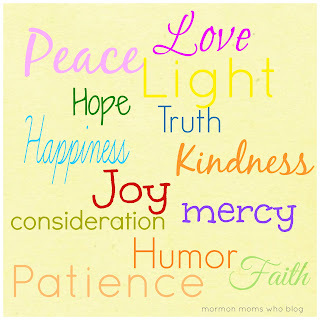 Consideration: Consideration, Kindness, Empathy fill us with the light, peace, and joy we come here to attain. Let us always focus on the Light of the World, which makes us better, helps us heal, gives us hope for better days to come, leads us to love, kindness, consideration and mercy for one another. Words matter! They make a difference in how we feel, heal, and see the world. Let us focus on the good ones that fill our lives with love, joy, and happiness!